I felt sad when I woke up on February 20th. I had heard two due dates from my doctors– the 20th and the 21st, and after my doctor’s appointment earlier that week, I had begun to feel like you would never arrive! I stayed in bed until noon, trying to sleep the day away. Even though I felt nearly certain that you would be at least a week late, there was just something about those dates. I had been hoping for them for 9 months. Looking forward to the day that I would get to hold you in my arms for the very first time. 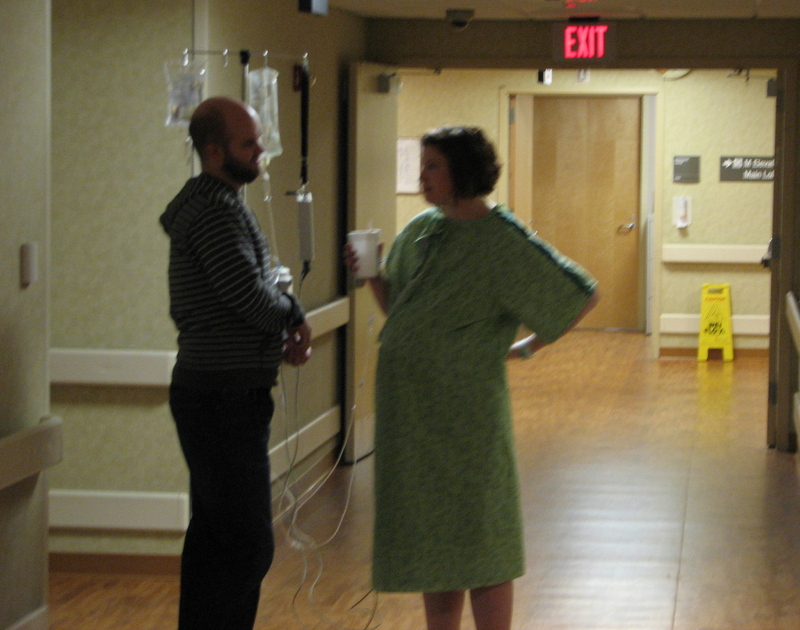 And, to be honest, I was super excited about labor. I had done a lot of reading and was confident that the Lord had made my body for this work and would sustain me, and I honestly couldn’t wait to experience it. Little did I know, I wouldn’t have to wait long. It’s worth pointing out that your daddy was supposed to be in Kenosha at this time, but due to some work complications, he was stuck working from home. I ate an orange, said “Wouldn’t it be funny if my water breaks on this walk?” kissed your daddy, and walked out the door. I started out on a walk that had become very familiar to me throughout my pregnancy: out our door, through the parking lot, around campus, back to our apartment. I had created a birthing playlist, and I would listen to it while I walked and I would pray for you, for me, and for a healthy delivery. When I went for this walk on February 20th, I didn’t even make it through the parking lot. My water broke before the first song ended. I was so excited, I think I giggled, quickly made my way back to the apartment, and told your daddy we were going to be meeting you soon! This is really, really happening! Oh no! I haven’t eaten dinner! Oh no! People are starting to arrive! I’m not going to meet her today! At least I’ll get to eat dinner. In the style of Anne Hathaway in The Princess Diaries. Not my proudest moment. Then, just in case I had any lingering doubt, my water REALLY broke. I mean, all of the sudden I knew why the nurse was skeptical of me, and I laughed. This, dear daughter, was one of those times that laughter starts deep inside of you and rolls through you and comes crashing out of you the way the waves do at high tide. The joy I felt at that moment– it’s a memory I treasure. I relived the joyful thoughts I had in the car. You really were coming! This really was it! I finally got into a room around 7, and still wasn’t having many contractions. My doctor started me on Pitocin, because they like to speed these things up as much as possible. 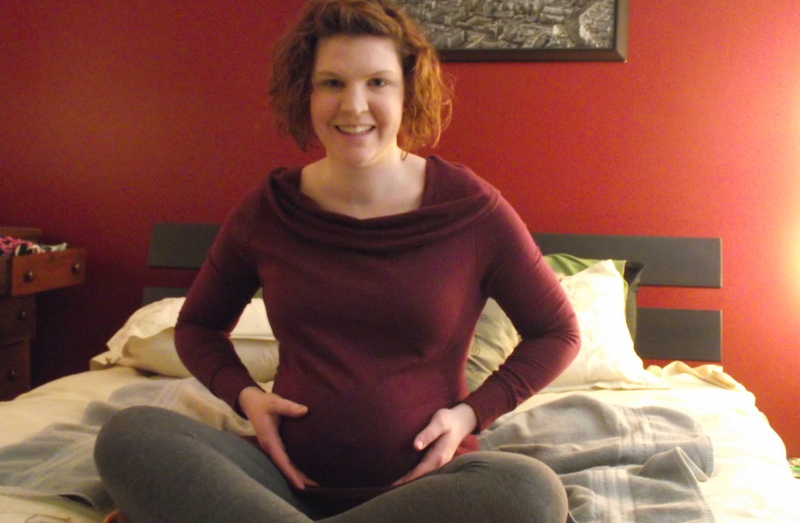 I communicated my desire for a natural birth, and my doctor said “No need to be a martyr, Lindsey,” and walked out the door. I laughed about that, too. Stubbornness can be a gift, dear daughter, and the doctor’s comment, though it had nothing to do with my reasons for choosing what I did, motivated me all the more. Fortunately for me, I had an amazing nurse, Jessica, who understood exactly what I planned to do and promised that she would do everything she could to help me. The next several hours were a lot of walking around the hospital and talking with family and friends who had wanted to be there for your birth. I actually spent most of this time in the waiting room. In labor. Hanging out with a bunch of people who were eating dinner. Remembering fondly that 3pm Orange. Around 2:30 am, the work started. By this time, your daddy and I were in the room alone, and all the visitors were waiting patiently in the waiting room. These were the contractions that required work, and your daddy and I did the work over and over again. This was when we started listening to the playlist I had so often listened to in anticipation of this day. I’m saving this playlist for you, sweet girl. Not one song on it was chosen carelessly. It is full of music that I played for you while you grew, music that reminds us who cares for us, music that worships the God who made our bodies and who gives us life, music that speaks of his good gifts and of his faithfulness. Let me tell you about your daddy, Ellie Jo. He sat there with me, encouraging me, holding me, and praying with me through the whole thing. Together, while we labored to bring you into this world, we worshipped. 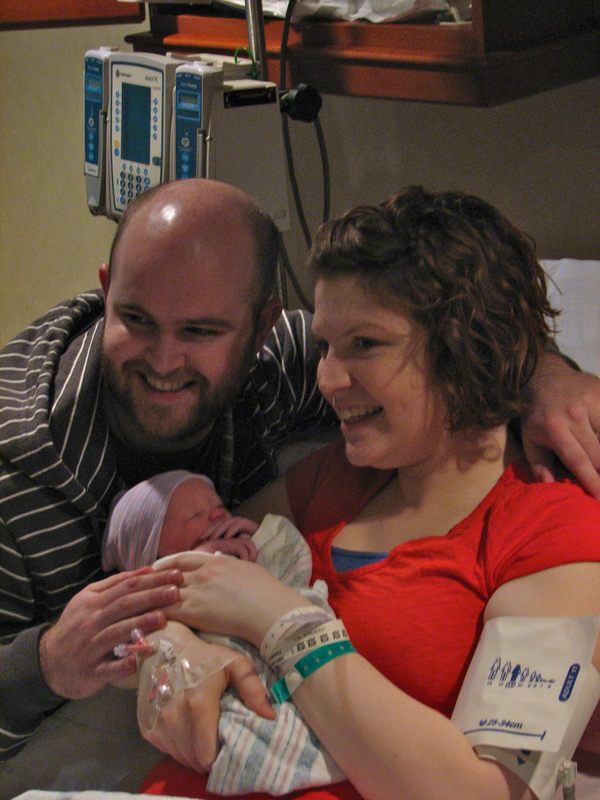 As we joined God in his work of bringing new life, we thanked him for his goodness. And as I leaned my laboring body against your daddy’s chest, I leaned my soul on the one who made it. And he was there with us, Eliana. The one who granted us the grace to carry you carried us. In labor I learned something valuable for life, the leaning is the labor. As the time of your arrival got closer and closer, I made my way to the bed. The doctor came, and it was finally time to push. I am pretty sure it was time to push before the doctor came, but they like the doctor to be there for those things. I pushed for maybe 10 minutes, and I was surprised the entire time that it wasn’t worse. After hearing all about how unbearable it can be, and after doing the hard work of labor for the previous 6 hours, I could hardly contain my excitement. I heard the doctor point out your head to daddy, and I couldn’t believe we were almost done. I laughed again. It was mind blowing to me that your daddy was seeing you, actually seeing you for the first time. Just one or two more pushes and you were here. 7lbs. 10 oz. wispy reddish hair and perfect milky-pink skin. You were placed on my chest and time stopped. My heart felt so full, I was sure it would burst. I couldn’t stop looking at you. I couldn’t stop. 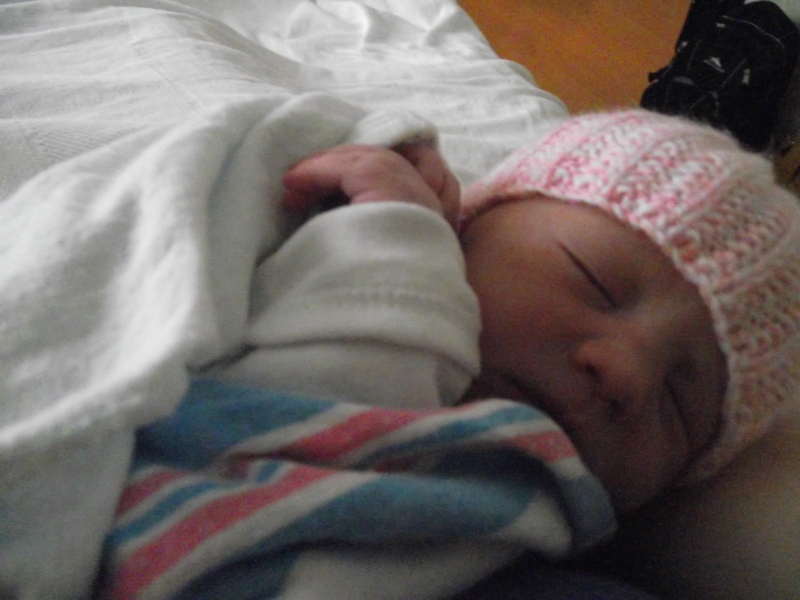 I marveled at the fact that you, my sweet, darling daughter were actually in my arms. Your skin on my skin. I breathed you in, I kissed your head. your face. your hands. Your daddy leaned in close, and we sat. We cradled you. I fed you. I never wanted to let you go. But, inevitably, they took you to weigh you and measure you, and make sure you were healthy. Your daddy went with you. He stood by your side. He talked with you. The wonder and joy that I saw on your daddy’s face that day blesses my heart. Your daddy doesn’t get excited about much, but now I see that look on his face every day, Eliana. That look of wonder that the Glorious God who made every human being would choose to entrust us with the care of your precious life. Oh, how your daddy loves you. Once things were all straightened out, I had the most delicious glass of orange juice I have ever had, and demanded to hold you again. And then, what a treasure it was to introduce you to the dear, sweet people who had loved you since they first heard you were coming, who all asked to be there while we labored. Nana & Grandpa Dan, Grandma Karen & Grandpa Greg, Auntie Kelley, Auntie Emily, Uncle Andrew, Uncle Scott. After a long night of praying and waiting, one after another, they all joined us in that room, and your daddy introduced you. We shared your name for the first time, giving glory to the One who has given you to us. After all our faithful labor, like the Lord who has given you to us, we rested. For hours, I just held you and stared. Quietly and peacefully, we rested and thanked the Lord for his good gifts. I saw this post on David’s Facebook today, we worked together at Camp Forest Springs. It caught my eye because I am pregnant with my first, due in October. Thank you so much for writing out your story. It is such an encouraging one as I read about labor and look forward to our own experience. I’m happy for you and David and sweet little Ellie! What a blessing to hear that this encouraged you! Thank you so much for taking the time to let me know, and congratulations on your growing family! Motherhood is. the. best. “No need to be a martyr.” Yikes. I’m glad you are one tough cookie!